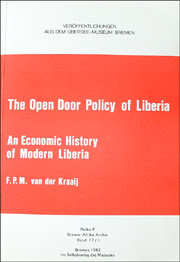 The original publication of the “Open Door Policy of Liberia – An Economic History of Modern Liberia” (1983) now as pdf-file available. The study covers the prelude, introduction, growth and zenith of foreign investments in Liberia. After the Doe Administration and the civil war Liberia had to start from scratch. The lessons of the past should not be forgotten. This entry was posted in Liberia, Liberian Economy, Liberian History. Bookmark the permalink.